The storage tanks are used in industries such as food processing, agriculture, chemical mixing and for manufacturers requiring liquid dispensing capabilities etc. and are available in a wide range of sizes from a few gallons to thousands of gallons. Stainless Steel Storage Tanks – Frain Industries, Inc. Stainless steel is an ideal material choice in food processing and kitchen equipment for many reasons and thus is used for food grade tanks and dairy tanks as well as storage tanks. Stainless steel tanks have also recently come to be valued by wineries for the fermentation of wine using double walled tanks. SS is a corrosion resistant material which is an important physical property in industries with prolonged exposure to moisture. It is also resistant to the absorption of stains or tastes from products it comes into contact with. It is one of the most sanitary metals and is easy to clean and maintain without requiring paint or other finishes. The antibacterial properties of stainless steel further add to its appeal as a clean material to work with. Stainless steel is also durable and long lasting, allowing it to be cleaned and reused numerous times without significant deterioration, ensuring it is a cost-effective storage choice for many applications. Furthermore stainless steel is 100% recyclable, allowing manufacturers to make environmentally responsible choices with old or unused tanks. As the tanks can be used for a number of different applications, there a wide range of specific types and components that a customer can choose from. Stainless tanks can be positioned as either horizontal or vertical, depending both on the loading and unloading method of the operation, and also the properties and use of the substance contained within the tank. They can also be flat bottomed or cone bottomed, cylindrical, square or spherical as well as single walled or double walled. The stainless steel vessels which are combined with hydraulic pressure are typically cylindrical in order to be able to endure the stress of the liquid or gas and pressure. Other features which may or may not be included with a storage tank include sight gauges to determine product level, exterior ladders, tank covers, ducting and pumps, instrumentation, exhaust systems and scrubbers. These may or may not be necessary depending on the intended application and location of the tank and the engineers should determine how much additional equipment is required in order to achieve the best storage solution. 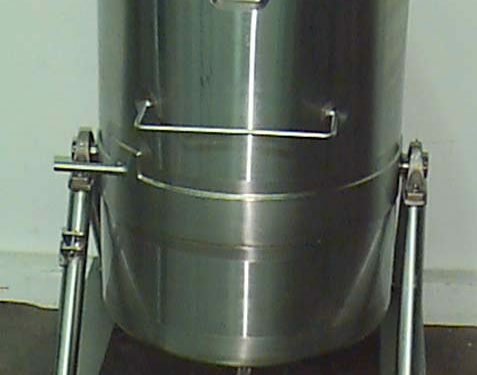 Stainless Steel Storage Tanks Stainless steel storage tanks are those tanks designed specifically to securely hold liquids, gases and other substances temporarily or for long periods in a clean and sanitary method.